We got the following e-mail from Harvey Yu of Ateneo de Manila University's Registration Committee, the student organization tasked with overseeing the class registration of all college students every semester. It was a pleasure hosting the members of the Regcom in Forest Club and a bit nostalgic too as both Wawel and I were members of Regcom in 1988 and 1989. A good twenty years ago when we were just starting with computerized assessments and when students used to line up as early as 2 am to get into the classes of the best philo or theo teachers. Thank you, Harvey, for your feedback. Twenty-three members of Ateneo de Manila University's Registration Committee had an overnight planning and team building activity in Forest Club last 23 to 24 October 2009. The Registration Committee is the student organization tasked with helping set-up and manage the registration process at the start of each semester. For more photos of the activity please visit our multiply site. More than three hundred students from St. Paul School in Sta. Maria, Bulacan traveled all the way to Forest Club in Bay, Laguna to spend a whole day of outdoor activities last 21 October 2009. The Grade 4 to Grade 6 students went through the Eco Adventure Program which included Survival Games, Field Games and swimming activities. St. Paul School in Sta. Maria, Bulacan is just one of thirty-five schools all over the Philippines run by the St.
Students from Cebu International School flew in all the way from the Queen City last 12 October 2009 for a five day field trip.Using Forest Club as their home base, the Grade 7 students visited several places in Laguna including the International Rice Research Institute in Los Banos, the Philippine National High School for the Arts, Jose Rizal's house in Calamba and the Boys Scout Jamboree site in Mt. We just want to assure our clients, partners and friends that Forest Club was spared from the wrath of Typhoon Ondoy and that all our staff are safe and dry. Forest Club remains open despite the flooding that has affected some parts of Bay, Laguna.In fact, we never closed. On the 26th of September, when Ondoy's rains came pouring down on Southern Luzon and Metro Manila, we even had a group from Shell Shared Services as overnight guests.We are very thankful that Forest Club is situated in on relatively higher ground in Barangay Puypuy in Bay, Laguna. Fifty Grade 7 students from Southville International School and Colleges (SISC) in Las Pinas had a three-day, 2-night team building seminar in Forest Club last 23 to 25 September 2009. A regular visitor to Forest Club, SISC is the only international school in the Philippines that offers a complete array of educational programs, from preschool to college. For more information on SISC please visit their web site. To view more photos of this event, kindly log on to our multiply site. 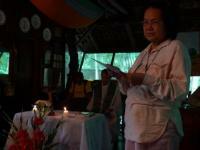 Environmentalist, writer and ecological artist Odette Alcantara passed away at the age of 68 on Monday, 21 September 2009, after suffering an aneurysm. Alcantara is most notable for her strong environmental advocacies. She was convenor of Artists for the Environment, founder of Earth Philippines, and Philippine coordinator for the Earth Day Network. Forty-five second year high school students from the Southridge Afternoon School went to Forest Club last 9 to 11 September 2009 for their student seminar. The seminar included classes on good study habits as well as talks on virtues and values. 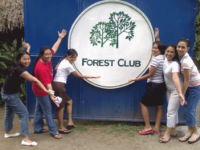 They also had team building activities using Forest Club's Eco Adventure Program. The Southridge Afternoon School is a high school unit initiated in 1987 for deserving students of limited financial means. The students receive the same quality of education and formation that characterize Southridge. The first batch graduated in 1991.